Everyone agrees that subways are crowded and that subway lines need repair. 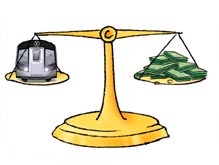 Many believe that the subway must expand or it may choke off future economic growth. But the Transportation Bond Act is not the answer. New York State's transportation systems require considerable renovation and expansion. Statewide roads and bridges are in bad condition. These concerns are real and pressing. New York needs a strong transportation system in order to remain competitive with other cities. But the bond act on the ballot is not the only way to accomplish that goal. What is too often overlooked is the effect on New York State's debt burden -- a burden that city taxpayers bear just as much as those upstate. State debt has doubled in the last decade, and is now $37 billion. If the bond act passes, it will grow to $43 billion in five years. A recent analysis we did at the Citizens Budget Commission of debt burdens among the 50 states suggests that New York exceeds a "danger zone" threshold by $3.0 billion. Yet the State's current capital plan, which includes the bond act, will leave New York in this same debt zone when it is completed in five years. The bond act is intended to provide $2.2 billion to support the State Department of Transportation's $17.1 billion five-year capital plan. The danger is not the risk of default. The risk is that state debt is so far out of line with that in other states that New York may not be able to compete in coming years. Repaying debt may require tax increases or service cutbacks that would make New York less attractive than competitors. The bond act does have the virtue of authorizing general obligation debt. This is the "good" kind of state debt, preferable because it carries the full faith and credit of the state and therefore lower interest costs. However, the overall state plan relies even more on backdoor borrowing. This is the "bad" kind of state debt, where the state gets around the voters by having public authorities issue the debt on its behalf at a higher cost. Beginning in the 1960's the state began its unwise and expensive policy of relying routinely on backdoor borrowing, and today about 87 percent of the state debt is of the back door type. Essentially, the bond act is part of a state financial plan that relies too heavily on borrowing. A better plan would have more pay-as-you-go support (particularly through the use of the State's surplus), a greater reliance on user fees for highway projects, and perhaps more general obligation debt and less backdoor borrowing. Transportation infrastructure should certainly not be neglected. But the Department of Transportation and the Mass Transit Authority capital plans that the bond act would partially support are not good ways to attack this important problem. Not only should they rely less on borrowing, there is also too much "pork" in this bill. In this instance, the pork is $40 million set aside for undesignated projects that legislative leaders can spend as they like. Enhanced versions of the plans with a more systematic assessment of needs should be developed. In the end, the $3.8 billion bond act is a bad idea for New York. The governor and the legislature need to go back to the drawing board. Hopefully citizens can soon endorse enthusiastically an improved act, supporting more meritorious capital plans in a fiscally responsible way. Diana Fortuna, is President of the Citizens Budget Commission a nonpartisan, nonprofit civic organization devoted to influencing constructive change in the finances and services of New York City and New York State government. Check out the Commentary Archives!